DESCRIPTION Location, Location! 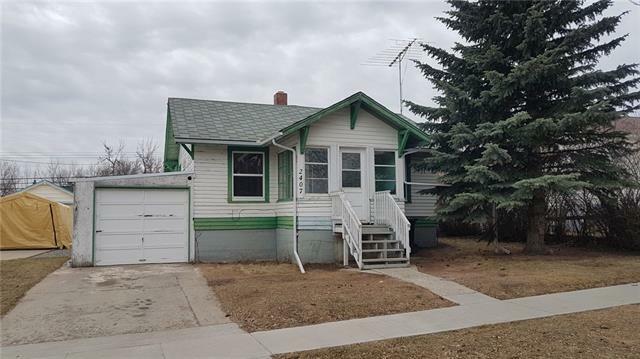 Just a hop, skip and a jump away from the schools, this large bungalow has had 2 owners and is truly a perfect home for raising a family. The main floor offers a spacious living room with gas fireplace and bow window, an oversized eating area off the kitchen which both provide ample space for a large family. Enjoy the garden doors off the dining area to the back deck and maturely landscaped yard. There is built in shelving and wall unit, breakfast bar, corner pantry, telephone nook and vaulted ceilings. You will also find 2 bedrooms, master bedroom, 4 piece bath and a 4 piece ensuite with jetted tub. The master bedroom also features a skylight, garden doors to the deck and a walk in closet. The basement is fully developed with 3 more bedrooms, family room, 4 piece bath and a 1 piece bath. Other features include a 75 gallon hot water tank, central vac, RV parking, central a/c, and an over sized mature lot that is private. Enjoy the perennials, fruit trees, greenhouse and firepit area. Courtsey of LIVELY REALTY LTD..
Home for sale at 410 Slade Pl Nanton, Alberts T0L 1R0. Description: The home at 410 Slade Pl Nanton, Alberta T0L 1R0 with the MLS® Number C4239162 is currently listed at $395,000.